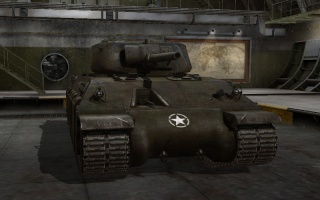 Der T14 ist ein amerikanischer premium schwerer Panzer der Stufe 5. Entwickelt zwischen Mai 1942 und Mai 1943. Nach der Erprobung wurde die Serienfertigung zunächst genehmigt, aber letztlich wiederrufen und so blieb der T14 ein Experimentalfahrzeug. Zwei Prototypen wurden gebaut. 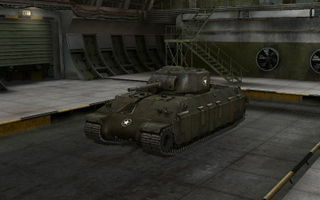 With well angled frontal armor, layers of spaced side armor, and a rock solid turret, a properly angled T14 can withstand hits from all but the biggest guns available at tier V. Though it can take a great deal of abuse, the poorly armed T14 isn't very good at returning the favour. 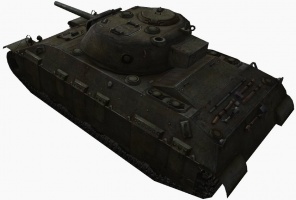 Capable of bullying smaller opponents and outmaneuvering larger ones, the T14 is equal parts heavy and medium tank. 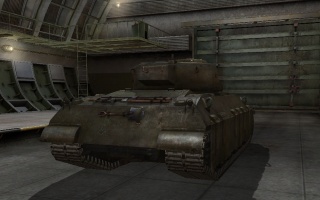 This tank was removed from sale in the gift shop and to buy for gold via the in game tech tree on 4/5/15 with the release of 9.7 Premium Tanks: Removal from Sales as part of the WG retirement plan. Hull is thin (for a tier V) but deceptively strong due to heavy angle; Turret is even thicker and well rounded. Spaced side armor bounces multiple shells and negates HE and HEAT as a threat. Nearly 50 ton weight combined with 34 km/h top speed means ramming is a valid option. Gets Premium MM, useful considering it's subpar gun. The gun has poor pen. 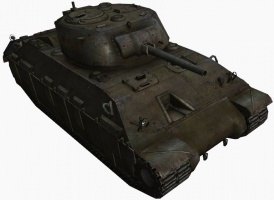 and horrid accuracy; will struggle against Tier IV heavies and most tier V tanks. Very slow hull and turret traverse makes flanking a high risk. Small strips of armor above the skirts are only 51mm and can be penned by even tier 3 guns. The MG port is a glaring weakspot (only 63 mm). The turret is deceptively weak to guns bigger than those on mediums and lights and cannot be angled effectively. 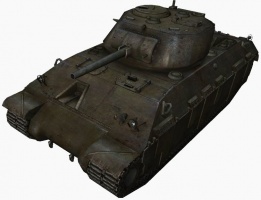 Though the T14 may have a number of features more typical of medium tanks, its armor is not one of them. The T14's hull armor isn't particularly thick in most places, but it's very well angled. Oddly enough, the most well sloped part of the T14's nose is also the weakest area, also containing the tank's machine gun port (its most glaring weakspot). The lower sides of the tank are covered in spaced armor, which protect it from HE and HEAT rounds. The turret and lower glacis are the most well armored places on the tank, which means the T14 can easily take advantage of angling and hull down positions. Unfortunately, you must be wary of the seemingly strong turret. 101mm of armor seems nice, but the turret front is poorly sloped, and the mantlet adds little. 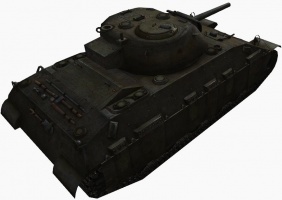 The cheeks of the turret (front not covered by the mantlet) will certainly not stand up to anything more than light tanks or small medium tank guns, and the mantlet will not reliably protect you from vehicles like the kv1, especially if they hit the unrounded horizontal middle of it (think maus turret, with angled upper and lower parts but a flat middle), or tank destroyers. Tier 6 vehicles will chew through it. Gold will make short work of the turret, and the hull if you do not angle. Even so, the simple thickness of it, and the angles of the top and bottom of the mantlet, will pull off some bounces. Despite having all this armor, the T14 is fairly quick thanks to its powerful engine. Though the T14 may be able to take a beating, its armament has a hard time doing damage in return. 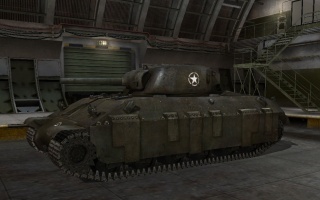 The T14 is armed with the same 75mm M3 cannon used by the M3 Lee. Its alpha damage isn't particularly bad, but its biggest issues come in the form of its mediocre penetration and terrible accuracy. 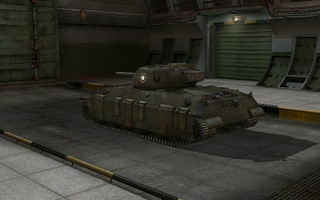 While powerful enough for taking out smaller lights and mediums, the T14's gun struggles to penetrate other heavies. When faced with large, well armored opponents, the T14 often needs to use its speed to flank and outmaneuver them. Unfortunately, while fast in a straight line, the T14 has very slow hull and turret traverse speeds, which complicates this. Because the T14s traverse speed is so marginal, a T14 with an inexperienced crew will struggle to maneuver. The best way to mitigate the few weaknesses the armor has is to keep moving. Charging the enemy makes your hull weakspot harder to hit and oftentimes creates a sense of urgency for your opponent. This results in lower tiers jumping for the obvious hull weakspot that is now harder to hit, but for which they will aim for guaranteed pen over the turret, and can make higher tiers forgo aiming at the turret in exchange for faster hull shots that an angled hull may bounce. As your accuracy is already poor, spamming shells while doing all of this is the best way to increase the sense of urgency while dealing damage, so long as you center the reticle over the enemy's weakspot. The use of high-octane gas will make your tank slightly more maneuverable in the brawl that follows the charge. It also will increase your turret traverse speed, to the great despair of any tank that attempts to counter your charge by circling you. 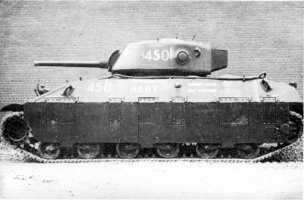 The T14 is very similar to the Excelsior, the British tier V premium heavy tank. 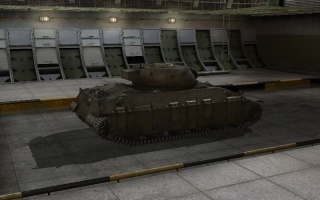 Both are well armored, quick (for heavies), and feature similar weak 75mm armaments. Generally speaking, the T14 is less "lopsided" than the Excelsior. It's hull armor is weaker, yet it can be angled more effectively. In addition, the T14's turret is smaller and well sloped, which allows it to take advantage of hull-down positions unlike the Excelsior. Although both are fairly quick in a straight line, the T14 is much less manueverable with 12 degrees/sec less traverse speed. Because the T14 is already sufficiently protected, equipment builds should focus on getting the most out of the T14's gun. A gun laying drive is necessary to mitigate the gun's awful accuracy. A gun rammer also comes in handy; since accurate fire is difficult in the T14, often times its just better keep firing unaimed shots instead of spending the time to aim accurate shots. The last equipment slot can be occupied by either vents or a toolbox, and which one is used depend on player preference. Vents will help improve the tank's poor turret traverse and accuracy a little, and a toolbox will help get the T14 back in action when tracked (as it likely often will be). 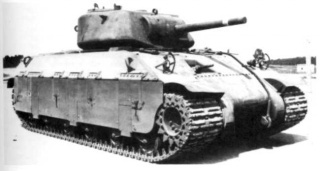 In 1941, the head of the United States Ordnance Department travelled to Britain to discuss designing a well-armed and armored combat vehicle, one that was stronger than the British Tank, Infantry, Mk IV (A22) "Churchill", then under production.